A rare find in this gorgeous mid century Venetian artisan crafted Lucite lamp, in the exotic Art Noveau style, flowers, leaves, and swirls adorn this monumental vessel. The colors are lavenders and purples on a clear back ground but change depending on the strength of the light bulb. There are a few hair line unnoticeable veins in the Lucite around the top opening, which does not take away from the beauty in anyway. Mid-Century Danish Modern bamboo and Lucite table lamp, with a Lucite base and top and matching original finial. New oval shade, three way switch excellent condition. 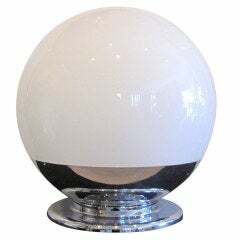 A Mid-Century Modern Murano Italian Venetian pagoda form lantern white ribbed glass globe single Edison light fixture. 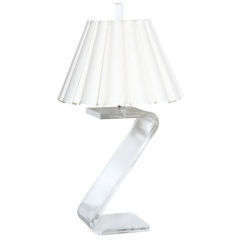 Very nice looking mid-century modern chrome and bent lucite table lamp. 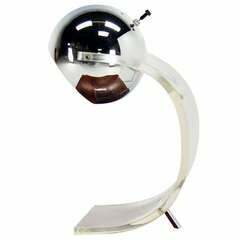 Large Mid-Century Globe Lamp of White Glass and Polished Stainless Steel. Unique Z shaped Lucite lamp. Unusual shape for a lamp, more commonly seen in chairs or tables. The lampshade itself is 14 inches high and 21 in diameter.